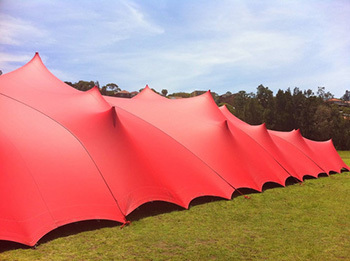 We have different sizes of stretch tents that can be used in different weather conditions. Due to their style and sophistication, our tents are highly adaptable to different types of terrains and they create a lasting impression. If you are planning a small personal event or a big exhibition, our stretch and Bedouin tent hire services in Durban are the best for you. All our tents are designed with stretch fabric for versatility, which allows them to adapt different styles and coverings for different situations. Whether you need a tent for open-air restaurants, pool canopies, balconies and outdoor decks, these stretch tents will work out perfectly. Our product not only offers protection from the sun or rain; they create a modern environment, which will ultimately increase the status of your event. Aladdin stretch and Bedouin tents are the most preferred tents for private companies as well as individuals who wish to make a strong impression on clients. They offer more than shelter to the people using them – they relay a sense of sophistication and a stylish look to the function. When you choose to hire a tent with us, you can be assured of plenty of services such as delivery, assembly and removal. Our experts adhere to all necessary safety precautions and they are available on short notice. Our competitive Bedouin tents hire services are available 365 days in a year. We are also available for draping & décor hire services. You can request a free quote now by calling 031 100 1905. Hurry up! Let us transform your event today.